Chainguides are designed to mechanically keep the chain from falling off the drivetrain, commonly used in mountain biking. A chainguide is to help prevent a dropped chain while mountain biking. Bikers who ride a single or double ring set-up on very rough terrain will benefit the most. 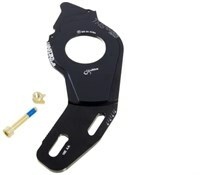 You can choose from an upper or lower chain guide, which helps keep the chain line in place. Lower chain guides work well with dual-ring set-ups, upper guides are good for single-ring arrangements. 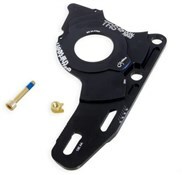 You can also get chainguides that come with an integrated bash guard. If you’re replacing a triple set-up, a bashguard that goes in place of the outer chainring is a popular choice. It’s crucial that you make sure your bike’s frame has the right fittings for your chosen chainguard. Some fit around the bottom bracket, others clamp around the seat tube and more still use ISCG tabs that are welded to the frame.